The major, explicit change is the selection of clams. I excluded Razor Clams, as I despise them — blegh. I also excluded Geoducks because they’re insanely expensive. 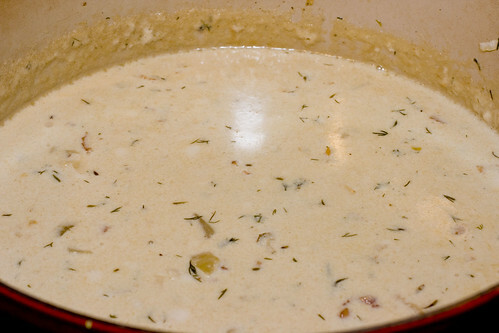 Honestly, this is, hands down, the best clam chowder I’ve ever tasted. I was worried it would be too fatty or too salty, but it was absolutely perfect. I’m amazed and will make this many more times in the future. 1. Spit Clams. 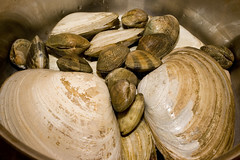 Layer clams into large pot (heaviest on the bottom), fill 1/3 height of clams with water. Steam ~10 minutes covered or until lid starts to rattle and hum. 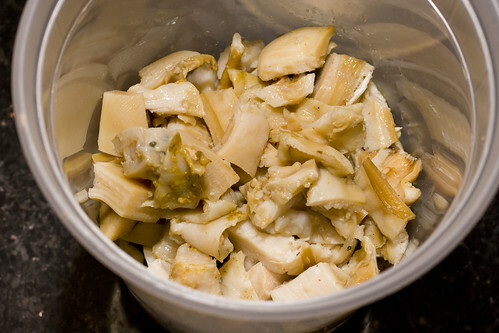 Remove clams; strain and reserve stock. 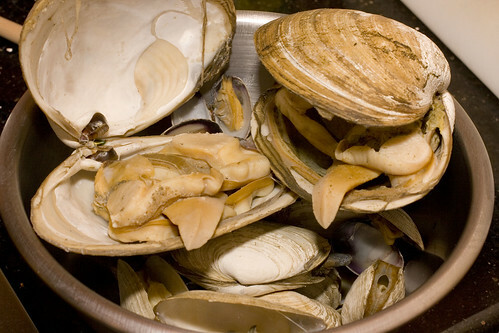 Clean steamers and quahogs, roughly chop clams to about 1/2″ pieces, reserve. 2. Render salt pork until golden brown, reserve fat and pork separately. Render bacon, discard fat, reserve bacon. 3. 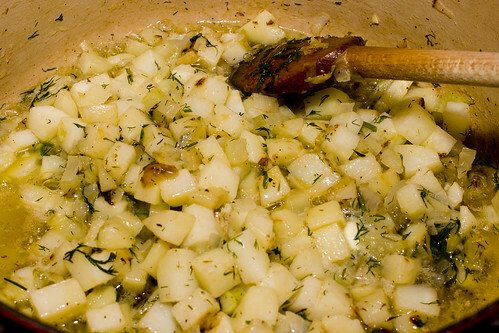 In a large pot, saute potatoes, onion, fennel, and garlic in salt and oil for about 15 minutes over medium heat, stir every few minutes. 4. Add butter, thyme, dill, sea salt, lots of fresh ground black pepper, reserved bacon, and fat from salt pork. Cover contents of pot with enough broth to cover the ingredients plus a bit extra (about 4.5 cups) then double that amount of broth with heavy cream (so about 4.5 cups). 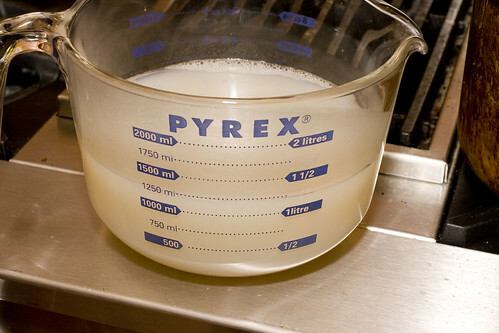 Bring to a rolling simmer (do not boil), then cook on very low for 25 minutes stirring intermittently. 5. Add Worcestershire, Old Bay, capers, and clams. Cook another three minutes, taste for seasoning, add additional salt and pepper, as necessary. Serve in bread bowl or with crusty bread. Garnish bowl with some of the golden pork fat pieces. posted by Lon	at 01:49 PM	Filed under American, Recipes. You can follow any responses to this entry through the RSS 2.0 feed. Both comments and pings are currently closed. Delicious! We’ve got to try fennel next time. 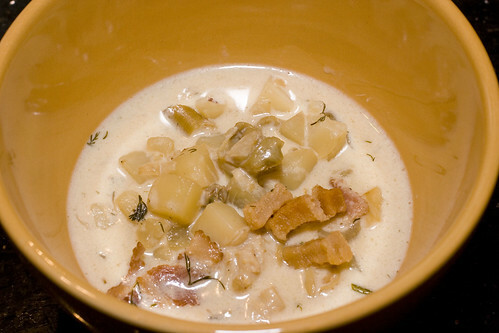 This clam chowder looks wonderful! I would leave out the capers though, I find them disgusting. Deviled Egg – if you can find the five capers in that pot of soup you win a prize 😉 Five capers in a huge pot, c’mon? In any, they’re there more for tradition, they won’t be missed.